Description: Pinfish Traps are built strong with 1" x 1" vinyl coated wire, 1/2" x 1" bait can, stainless steel crimps, 1/4" rubber tubing and hinged door on top. Size: Considered over size 2 per UPS, shipping will be slightly higher. 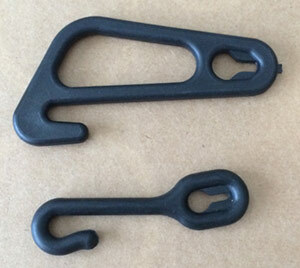 Description: Holding cages are built with 1" x 1" wire. Cages are 2'tall and 2'in diameter. Considered over sized by UPS, shipping will be slightly higher. Color: Varies:Black or Red. If you have a preference, please state in the comment section before completion of checkout. We will honor if stock allows. Description: Traps are built with 17.5 gauge, 1 1/2 " vinyl coated hex or square wire,1/2" x 1" red bait can, Stainless hog rings, 1/4" bungee cord & hook closure. Color: Varies as to what wire is available. State Requirements: If your state requires escape rings, they can be purchased separately (on this page, below) and installed easily with a simple cut of one wire. Size: 24" x 24" x 14". Considered over size 2 per UPS, shipping will be slightly higher. 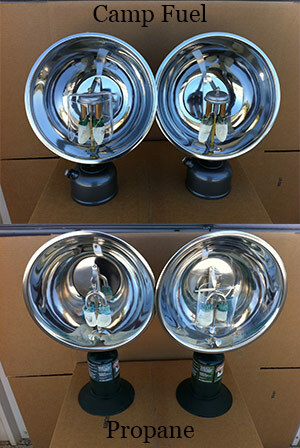 Description: This is typically enough to fix 4 traps; bait cans & entrance doors or minor repairs. Description: Some states require that a degradable line be attached to the exit door. 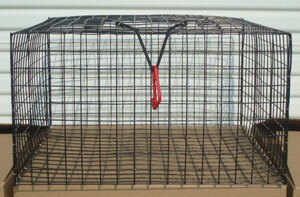 Description: Used to repair/construct crab traps -used with bungee cord & hog rings. 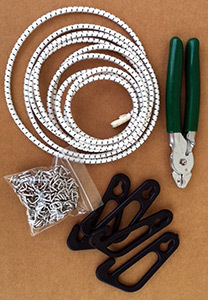 Bungee Cord 1/4" & 3/16"
Description: Used to repair crab trap doors or bait can closures. Description: The Professionals Choice. 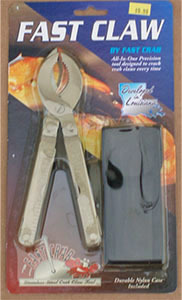 Made from hardened high carbon steel, or stainless steel. Color: Handle color may vary. Description: Just about any fastening problem dealing with wire, fabric, fence mesh, rope or cord can be solved with these 14 gauge blunt nose hog rings. 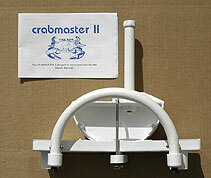 Description: Installed in traps to aid smaller crabs (less than 6") to exit. Use round on hex wire & square on square wire. General rule is 1 per hole. Size: 2 3/8" inside dia. Description: 6" float is standard for most state requirements.Hard black plastic grommet. Buoyancy: 6" = 4 lbs. 7 1/2" = 6 lbs. Buoyancy: 3 lbs. 5 oz. 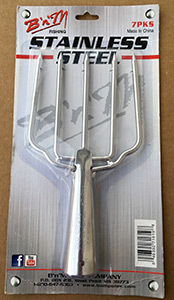 Can be used for regulation 6” crab trap float. 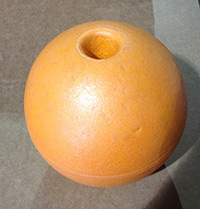 PVC float; high durability, very dense. Description: 3" protector, protects styrofoam float against the wear from your rope. 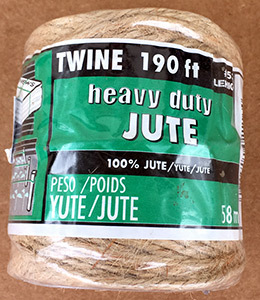 Description: Cotton twine with 18" top diameter & 16" bottom diameter; 3 cord pull-up lines. Just add bait. Great fun for the whole family! 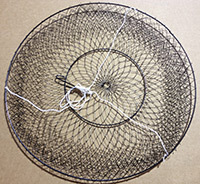 Description: Powder coated black wire -18" on Top, 8" on Bottom. Tripod twine line to connect rope to. Tie bait in center, & lower into water. Presto! A Crab! 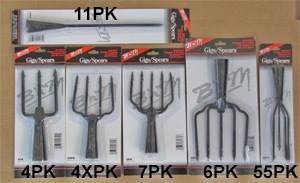 Description: 14" long, help you get remove crabs from traps, stingrays and eels from trawls. 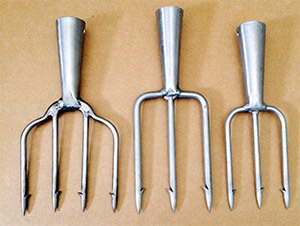 Made in USA.Tongs that last a lifetime! 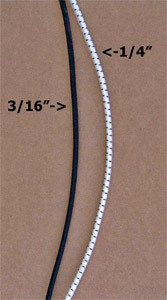 Description: 14" long, Black powdered coated. Imported. 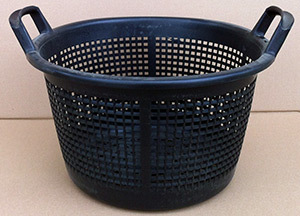 Description: Heavy duty Ropak seafood baskets.Large basket has 80 lb. capacity. Size: Measures: 19" x 14" x 15". Color Choices Will Be Honored As Stock Allows. Please note alternate color choice in the comments section before completion of order. We are happy to quote shipping rates verbally, please call 1-800-211-0518. 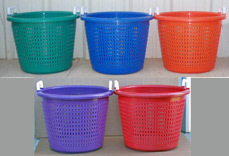 Medium Baskets (not pictured) are not Ropak. Made in Taiwan. 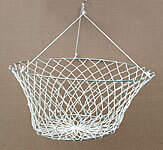 Description: Great baskets for fish, crabs, or gardening. We sell dozens to produce farmers all over the U.S. Color will be honored when possible. Description: 60 lb. capacity.11.3 gal. volume. Description: Tough high density polyethylene to last for many years.100 lb. capacity.18.5 gal. volume Price Break at 12- $19.80- CALL TO ORDER: 1-800-211-0518. Size: 31" L x 18" W x 11" H. Considered over size 2 per UPS, shipping will be slightly higher. Description: Watch minnows get trapped inside in no time at. Just bait with cheap canned cat food; with holes punctured in it. Works everytime!